Figurative language refers to the color we use to amplify our writing. It takes an ordinary statement and dresses it up in an evocative frock. It gently alludes to something without directly stating it. Figurative language is a way to engage your readers, ushering them through your writing with a more creative tone. Although it's often debated how many "types" of figurative language there are, it's safe to say there are at least five distinct categories. 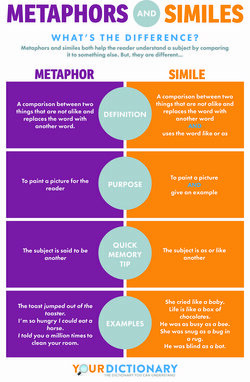 They are: metaphors, similes, personification, hyperbole, and symbolism. In this article, we'll highlight the main branches of the tree, or "the big five." In truth, this is only scratching the surface. There are waves of other literary devices that color our writing, including alliteration, onomatopoeia, idioms, irony, oxymorons, puns, synecdoche, and more. As a starting point, let's have some fun with the ones you're most likely to come across in your daily readings. Any time your writing goes beyond the actual meanings of your words, you're using figurative language. This allows the reader to gain new insights into your work. Let's dive deeper into "the big five." We'll consider their place in your writing, and give some examples to paint a better picture for you. When you use a metaphor, you make a statement that doesn't literally make sense. For example, "Time is a thief." Time is not actually stealing from you but this conveys the idea that hours or days sometimes seem to slip by without you noticing. A simile also compares two things. However, similes use the words "like" or "as." The tall girl stood out like a sore thumb. It was as easy as shooting fish in a barrel. My mouth was as dry as a bone. Watching that movie was like watching grass grow. Personification gives human characteristics to inanimate objects, animals, or ideas. This can really affect the way the reader imagines things. Personification is often used in poetry, fiction, and children's rhymes. Opportunity knocked at his door. The sky was full of dancing stars. The vines wove their delicate fingers together. The radio suddenly stopped singing and stared at me. The sun played hide and seek with the clouds. Hyperbole is an outrageous exaggeration that emphasizes a point. It tends toward the ridiculous or the funny. Hyperbole adds color and depth to a character. You snore louder than a freight train! It's a slow burg. I spent a couple of weeks there one day. I had to walk 15 miles to school in the snow, uphill, in bare feet. Symbolism occurs when a word has its own meaning but is used to represent something entirely different. Using the image of the American flag to represent patriotism and a love for one's country. Incorporating a red rose in your writing to symbolize love. Using an apple pie to represent a traditional American lifestyle. Using a chalkboard to represent education. Incorporating the color black in your writing as a symbol for evil or death. Using an owl to represent wisdom. The "stage" here symbolizes the world and the "players" represent human beings. Bronte uses imagery of the natural world to symbolize the wild nature and deep feelings of her characters. So, that covers "the big five." But, we'd be remiss if we didn't briefly touch upon some literary sound devices that can hang with the best similes and metaphors. Alliteration is a sound device. It is the repetition of the first consonant sounds in several words. We're up, wide-eyed, and wondering while we wait for others to awaken. Onomatopoeia is also a sound device where the words sound like their meaning, or mimic sounds. They add a level of fun and reality to writing. The burning wood hissed and crackled. Sounds of nature are all around us. Listen for the croak, caw, buzz, whirr, swish, hum, quack, meow, oink, and tweet. Regardless of the type of word you use, figurative language can make you look at the world differently; it can heighten your senses, add expression and emphasis, and help you feel like you're having the same experience as the author. With each brush stroke across the canvas a painter adds depth to their masterpiece. Figurative language adds the same kind of depth to our writing. So, instead of hearing the wind blow against your window tonight, perhaps you'll hear the whisper of the wind as it calls out for you like a lover in the night (personification and simile, respectively). That blank page you're looking at is actually a blank canvas. It's up to you to add texture and depth. Have fun layering your literary devices, but remember not to go overboard with them! "Examples of Figurative Language." YourDictionary, n.d. Web. 18 April 2019. 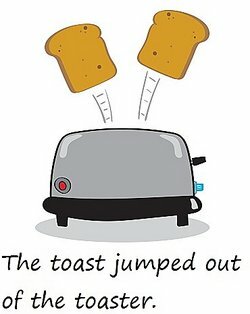 <https://examples.yourdictionary.com/examples-of-figurative-language.html>.